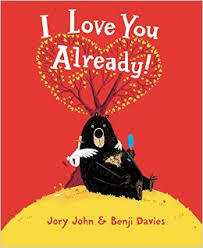 Well, the votes are in and we have chosen our Canadian Picture Book of the Year. 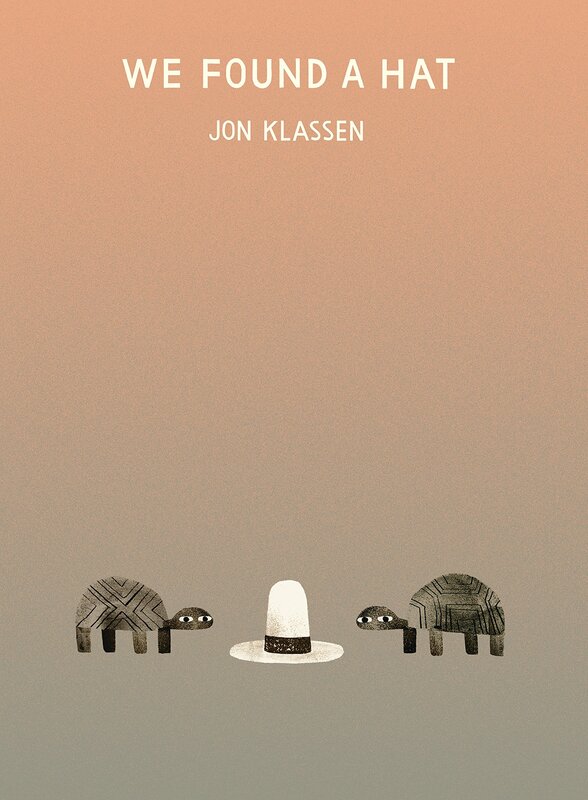 South Slope has selected We found a Hat by Jon Klassen as the winner! The pictures can tell the words and because the eyes of the turtles can make me laugh. The author made unique illustrations because he made the turtles shell patterns different from each other. It makes me feel like that other turtle who wants the hat to tell the truth of why he really wants the hat! It makes me feel happy because it reminds me of my dad since he always wears a hat. 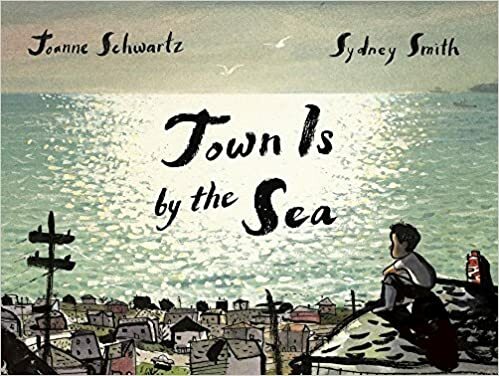 In close second place was Town is by the Sea by Joanne Schwartz and pictures by Sydney Smith. It makes me a little sad. I go to the graveyard to visit my grandfather, my father’s father. He was a miner, too. It reminds me that my town is by the sea. And it is a peaceful book. It has unique and creative illustrations. It makes me remember that I used to live by the sea. I feel that I’m in the book and it repeats. The pictures make me feel calm. We enjoyed reading and talking about the other books as well. When we were Alone was recently voted a winner in the Governor General Literary Awards. The Snow Knows was named the Marilyn Baillie Picture Book of the Year. 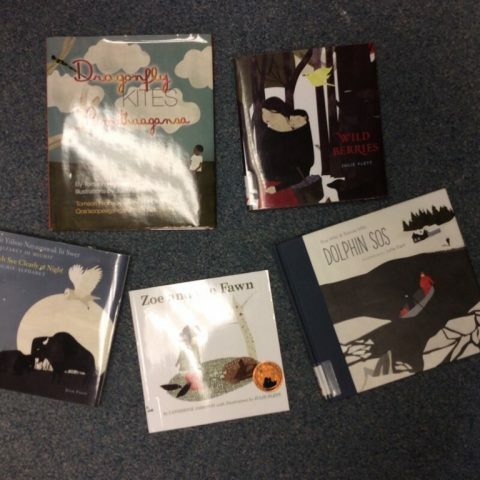 We look forward to reading more great Canadian picture books next year! 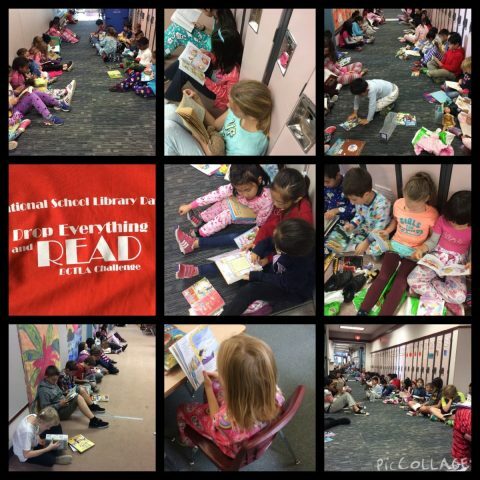 Please join us on Tuesday, Oct.24th as we Drop Everything and Read right after lunch all around the school. Everyone is invited to wear their pjs and bring a stuffed animal. Division 2 have been reading up a storm and they’re getting ready to share their love of books with the world. Students chose books they love and then were asked to write a 30 second book talk script to “sell” their book. Before they began writing students watched many book talks online and created criteria for their scripts and book talk. Now for the really fun part! 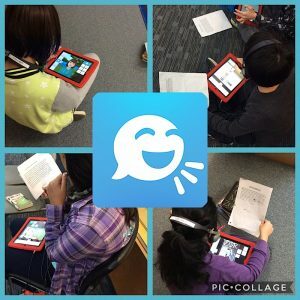 Students are now recording their book talks using the Tellagami app. Today the library, the atrium and the hallways were filled with students recording. Stay tuned for updates and information on how you can watch and listen. Thank you and please return your books! Last week students visited the library for their last storytime and book exchange of the year. We read the Thank you book by Mo Willems. This is the last book in the well loved Elephant and Piggie series. We will miss Piggie and Gerald, but I’m sure they’ll remain among the most popular of books to check out of the library. 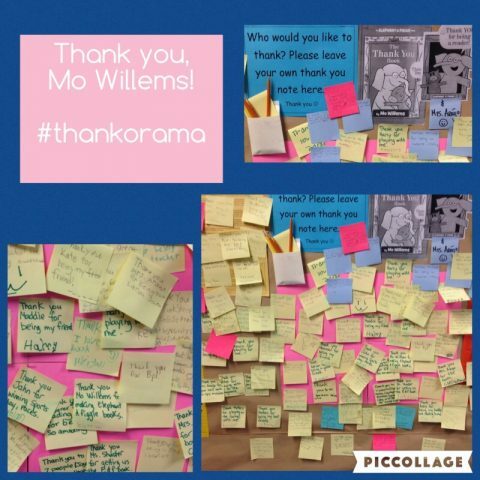 As a response to the book, students were invited to write a thank you to someone on a post it note and put it in the hallway. We wanted to create a “Thank-o-rama” for all to see! Come and have a look at some of the wonderful thank you’s that students and staff have written. If you want to leave your own thank you note, you are more than welcome! As the library begins the inventory process this year it is very helpful to have all books returned. The due date was June 13th so please check at home if you have any overdue books or maybe even in your desk or classroom. 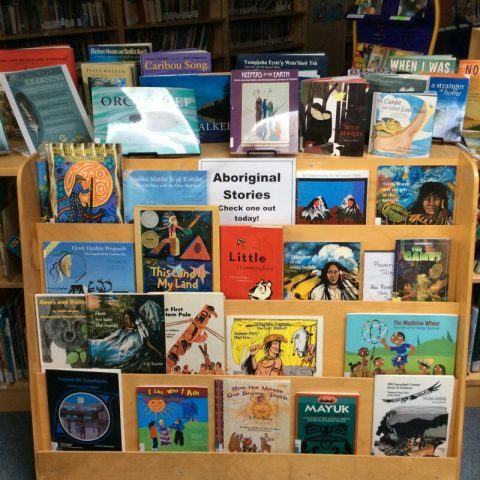 During the month of May we have been reading Aborginal stories in the library. 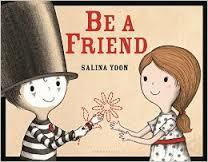 Some classes have been reading books by author/illustrator Julie Flett. We have noticed her use of the colour red and other earth toned colours. We also noticed how her books make us feel peaceful and happy. We have learned a few new words and phrases in Michif and Cree. 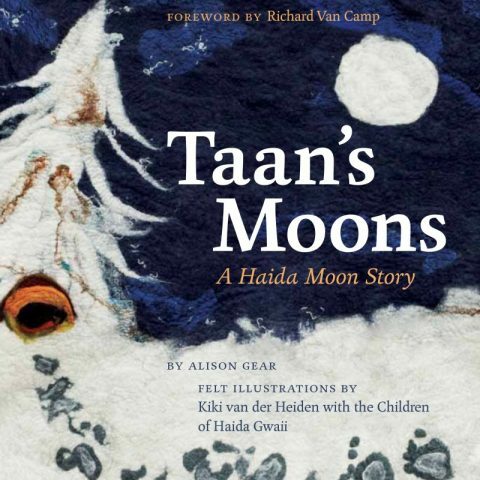 Other classes have been reading new books like Taan’s Moons by Alison Gear. We loved the amazing felt artwork created by Kiki van der Heiden and students from various schools on Haida Gwaii. 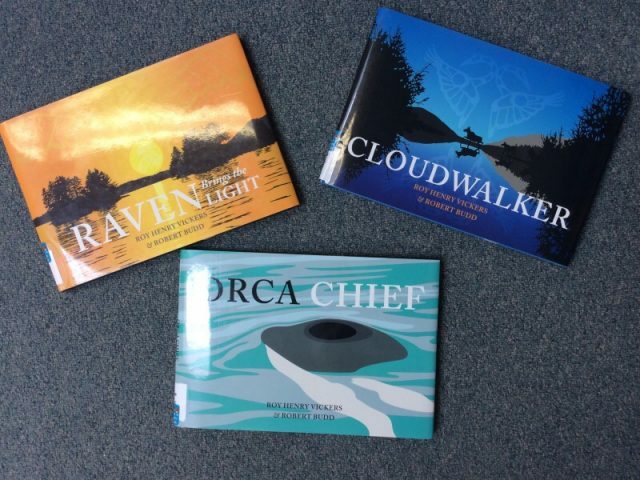 Finally some classes have enjoyed reading Orca Chief, Raven Brings the Light and Cloudwalker by Roy Henry Vickers and Robert Budd. We are amazed at the beautiful paintings and enjoy trying to find the hidden clues in each illustration. 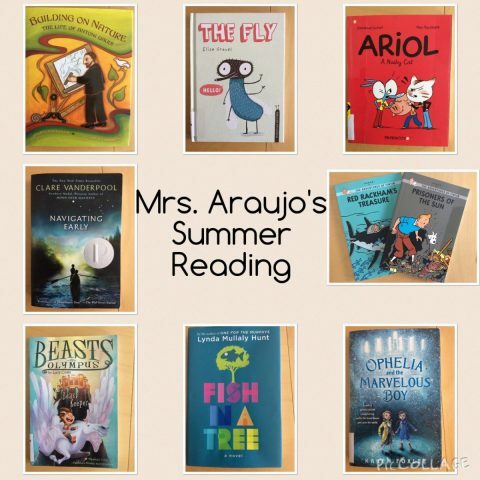 Come and check out these amazing stories any time from the library. 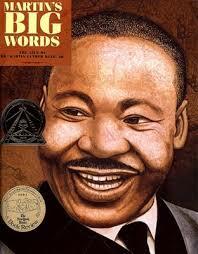 Fe bruary 24th is Pink Day, but did you also know it is World Read Aloud Day? What will you be reading aloud today? 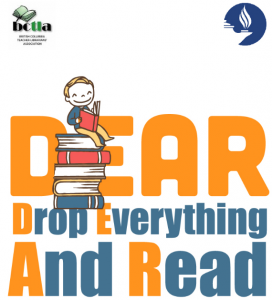 October 26, 2015 is the 9th anniversary of the BC Drop Everything and Read (DEAR) challenge. Dear started as a small challenge between school libraries in 2007 and has since grown to involve many participants across the province. The simple, but powerful idea of DEAR is to promote the importance of literacy by having as many students and adults as possible read at the same time on the same day. Today we celebrated DEAR by reading after lunch for 20 minutes. Everyone dropped everything and brought their books to the hallways, classrooms, the library and more. 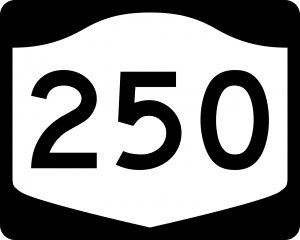 The goal for October 26, 2015 is to have EVERYONE in BC put down their work, turn off their computer screens, pick up a book, magazine or newspaper and read for 20 minutes. Reading is a beautiful thing!